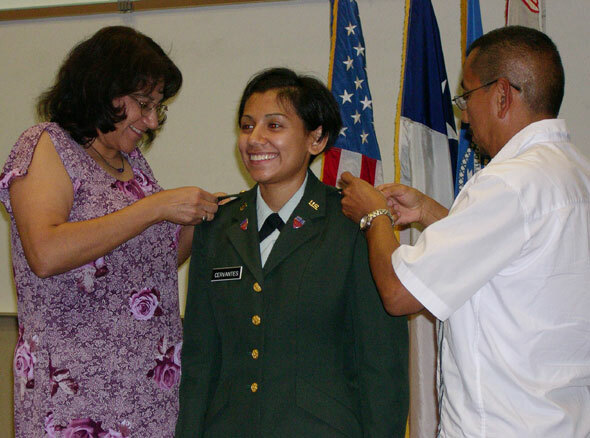 Cadet Amaris A. Cervantes (above) receives her pins as second lieutenant from her parents during the summer Bearkat Battalion Commissioning Ceremony on Friday (Aug. 5). Cervantes, who graduates Saturday with a degree in photography, has received reserve duty and will serve with the 100th Public Affairs Detachment at Camp Maybry in Austin. 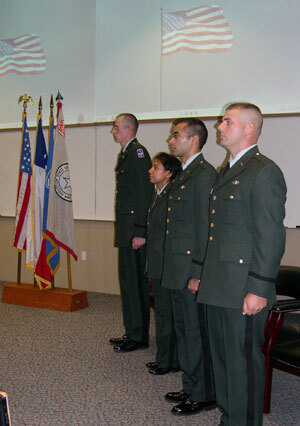 (right) The four cadets who will receive their degrees tomorrow and were commissioned as second lieutenants include (from right) Nicholas J. Norton, Armando L. Garza, Cervantes and Gregory W. Canady. Norton, who will find out his branch assignment later this year, aspires to become a U.S. Army Aviator. Garza, one of 15 cadets nationwide selected for the Robin Sage Internship Program held at Camp Mackall, N.C., was selected for active duty in the Ordnance Corps. Selected by the Army as a Distinguished Military Graduate, Canady has also received an active duty commission as an Engineer Officer.